Back in the day packs of cigarettes came with collectible cards - like the baseball cards some of you may remember from packs of chewing gum in more recent times. This series (there are dozens of them to browse here) featured the drum horses of various military groups, shown in all their parade finery. They were printed between 1908 and 1915. Drum horses are large and calm-tempered, carrying the musician who play the large kettle drums in military parades. Though used sparingly now, they were formerly common, predominantly in Western Europe. They were not originally of any particular breed, though draft horses were commonly used to provide size and sturdiness. Following on the recent popularity of the Gypsy Cob in the US, drum horses have gained new attention among fans of heavy horses. Organizations such as the Drum Horse Association are attempting to define a breed from the type, by allowing registration of horses carrying, for example, Clydesdale, Shire, Gypsy Cob and Friesian bloodlines. This site has some interesting and detailed background on the military history of drums and drum horses. Here is a part of the trailer for the IMAX film "Majestic White Horses", about the Lippizan horses of the Spanish Riding School. I wish I had seen the film in IMAX (it came out in 2007) - it sounds impressive. There is a full review of it here. And more info on the production company's page, here. 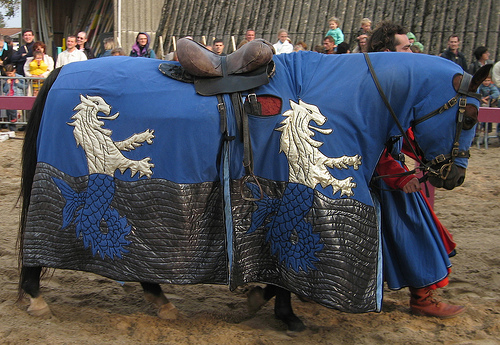 This Medieval Recreationist at a fair in France has his horse decked out in a delightful caparison. 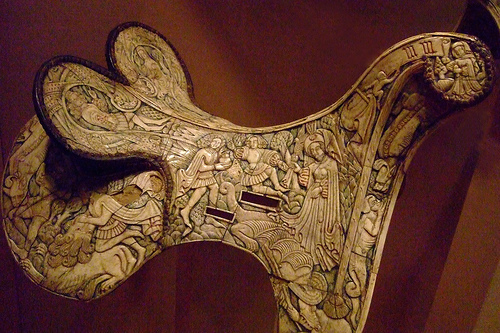 This amazing, intricately carved saddle is a Renaissance saddle from Tyrol. There are many additional detail photos on flickr. Saddles of this type were layered onto the horse - blankets or pads go on the horse, followed by the hard saddle shown here. Then additional pads or cloths were layered on top, to cushion the rider. Slots for a girth and stirrups can be seen. This type of saddle design is still used throughout the world in many cultures (gaucho, North African, much of Asia, and traditional Native American, for example). In modern American and European saddles, this hard structure is hidden inside the saddle, surrounded by the exterior leather and padding. In other words, the multi-layered saddle has become a convenient single unit. The ornate decoration on this saddle suggests it belonged to a very wealthy person, and was probably used only for special occasions. The saddle was photographed at the Metropolitan Museum of Art, in New York City. This horse sport is something like Polo meets Basketball - riders handle the ball (which is designed for easy gripping), pass it by throwing, and score by throwing it into a high net. While riding. Seems to have a fairly passionate following in France, in particular, although it is played internationally, and as of 2006 the US had a team capable of international competition. It was invented in France in the 1930s, but didn't gain widespread popularity until the 1990s. Here's the official site, for all the details. The site for the US Horseball Federation is here. This is strange but adorable. A Swiss girl takes her darling (and rather large) cow for a ride. Doesn't look like a very comfortable ride. Perhaps why we more commonly ride horses. Note the look of astonishment on the faces of the herd of horses at the end of the video. 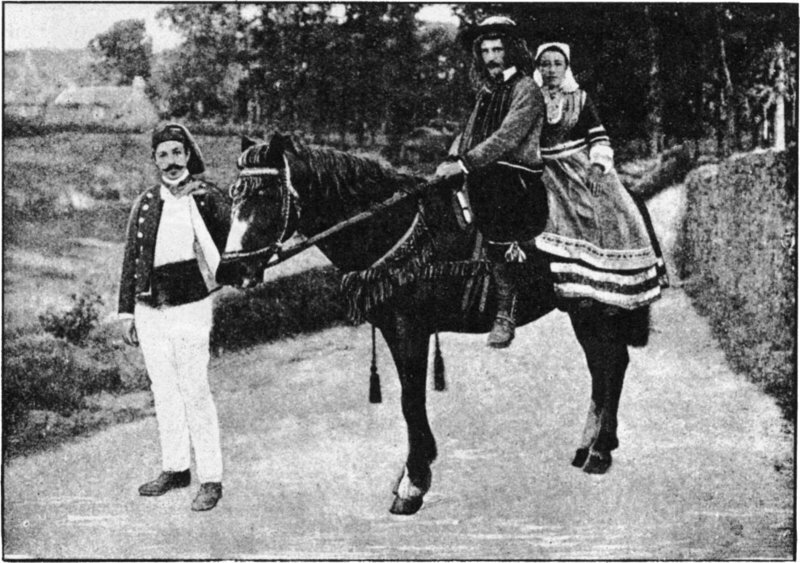 This old photo (from the turn of the last century) shows a bride and groom on their way to their wedding in Brittany, France. Their horse's tack is ornamented with tassles, including what appears to be a fringe hanging from the noseband, much like North African fly fringe (see this post). Photo from "The Secret Museum of Mankind." Actually, the Noriker doesn't have Appaloosa bloodlines - this color pattern has existed in Europe for centuries, where it is sometimes called "tiger" pattern (think "leopard" - same idea). The Noriker is a ancient draft breed from the Alps that is often spotted, though it comes in other colors, too. It has strong links to the classic baroque horses. This guy is beautiful! There are some nice photos here, too. Check out the beautiful halters and harnesses on some of these horses.